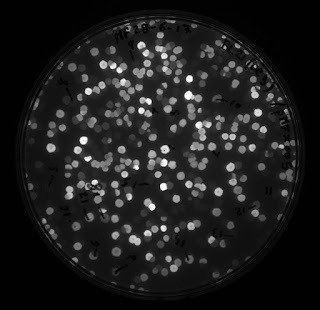 In a previous post I discuss the heteroduplicity of epPCR plasmids. Namely often colonies in a library will have bases that have two equal variants. The most likely cause being that the amplicons do not anneal perfect and that the transformed plasmids are actually heteroduplexes. These can either divide before being corrected or are corrected by mismatch repair. I did a sneaky experiment to see if this could be used to make protocol to shuffle mutations between variants and got a positive result, but possibly not as effective as hoped. Mismatch repair works by finding the closest methylated GATC and cutting from there and past the mutation by about 100 bp (Marianus, 2012). Maybe it is not that bad and can shuffle stuff around so it is worth checking —in reality I knew how base excision repair works and got the two confused, so I embarked on a small test with shaky foundations. But it gave interesting results nevertheless. In hindsight I should have checked the relationship between the FP used. First, I assumed mTFP1 and its derivative mWasabi were Aequorea victoria GFP variants because that is the case for the avGFP → EGFP → ECFP → Cerulean → sCFP3A → mTurquoise → mTurquoise2 series. Second, I did not check codon optimisation: my avGFP, mT-sapphire and mClover3 have a different encoding compared to sfGFP and YPet. I transformed the Gibson mix first into NEBTurbo, scraped the plate, purified the plasmids and retransformed into BL21(DE3) RIPL. The underlying logic was that I did not want colonies where the heteroduplex had simply been copied without repair, leading to a strain with two plasmid variants with unaltered sequences. The final plate showed a nice colour patterns once let to mature for a day on my bench. Parenthetically, adding white to a colour gives a tint (lighter), adding black a shade (darker), while adding gray gives a tone (less saturated). So I guess the colonies under normal light had various tones of green, but shades of green under fluorescence. 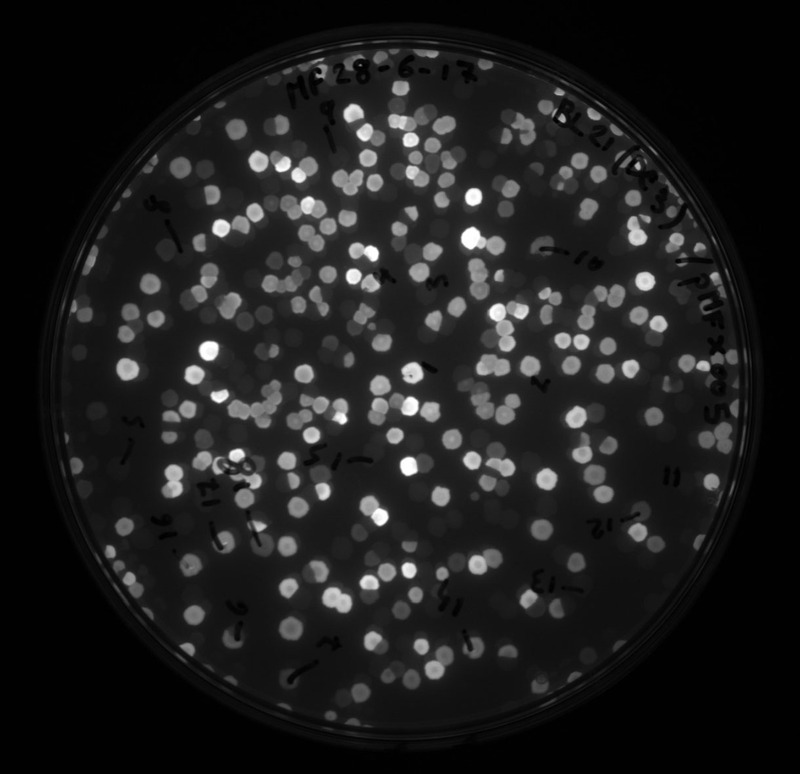 I did colony PCR and sequenced a few, I wrote a script to analyse the data (available at my GitHub page) and looked at the result. I found 3 mWasabi/mTFP1 pure variants, plus one of the mWasabi variants could be a hybrid but it's ambiguous. But I also found one hybrid of avGFP and mClover3. The avGFP and mClover3 hybrid has 15 mutations in the 5' half that are unique to mClover3 and not avGFP and has 15 mutations in the 3' half that are the reverse. So heteroduplex DNA does get fixed by mismatch repair and could be used to shuffle genes. However, despite the small sample size, it does seem that the genes need to be very similar or only the close ones will anneal. However, the mismatch repair system appears to behave harshly and not shuffle the mutations as well as I would have liked. DNA shuffling and staggered extension PCR are the normal way to shuffle mutations around. They require cloning and give smeary bands, whereas if a plasmid pool of variants were linearised with long overlaps, heated, cooled and transformed it would need a lot less hassle. However, the E. coli MMR is not well suited for the job. One option would be to knock out mutST and replace it with the archaeal or mycobacterial system (nucS), which has an endonuclease that chops the faulty strand off but only by a few bases (Ishino et al, 2016; Castañeda-García et al, 2017). However, having a custom strain would defeat the purpose of making it simpler. Furthermore, if that were the case, bigger fish ought to be tackled first, such as an in vivo mutagenesis system that mutates genomically only the target region and not the whole genome like chemical mutagenesis or the MP6 plasmid from Bradan and Liu (2015).